“Raoul” marks the eagerly anticipated return of James Thiérrée, last seen at the Brooklyn Academy of Music’s Next Wave Festival in 2007 with “Au Revoir, Parapluie.” As nonsensical as its title, that show was a completely delightful, non-narrative nouveau-circus piece in which five superb performers (including Thiérrée, who conceived, directed and designed the production) ceaselessly transformed the stage space, themselves, their costumes and props every minute of the show, going back and forth between silly and magical, literal and symbolic. When I say transformed, I mean completely transformed what you were looking at – pictures whirled into view and then disappeared, never to return. At one point they tore up the floor they were standing on! It was astonishing and fun, and the performers were amazing dancers, acrobats, aerialsts, and mimes, especially Thiérrée. Although it is much smaller and less magical than its predecessor, “Raoul” begins and ends with similarly spectacular transformations. What we see entering the theater looks like a sunken ship, its sails tangled and droopy, its masts smoking and wrecked. 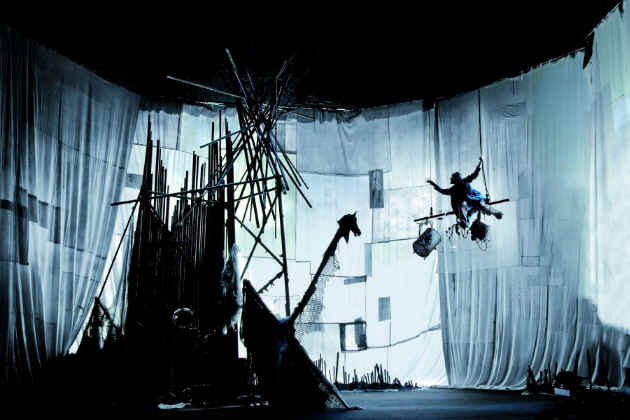 Suddenly, as if Prospero has waved his magic wand, the sails become curtains ringing the stage space at BAM’s charmingly decrepit Harvey Theater, and what had looked like the tips of masts turn out to be 15-foot high steel rods forming a kind of teepee within which the title character lives. By the end of the 80-minute show, the stage has been swept clear, leaving only Thiérrée swooping through black space (although we do get to see the intriguingly antique piece of flying machinery he’s harnessed to). 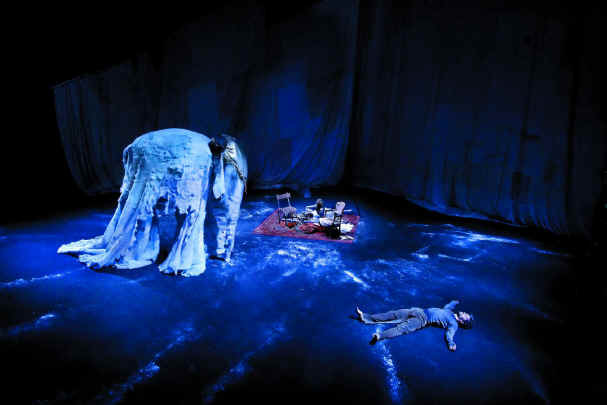 “Raoul” is ostensibly a solo piece, although a posse of colleagues show up disguised as a large asthmatic fish, a metal-plated crustacean, and a big ghostly elephant. (The ingenious and beautiful animal costumes were designed and constructed by Thiérrée’s mother, Victoria, whose father was the great silent comedy pioneer Charlie Chaplin.) There is also a storyline of sorts, having to do with Raoul’s struggle with loneliness and identity. Are we watching an existential drama (a la Beckett), or a descent into madness, or a dream? If only it were satisfyingly one of those. The story is mostly an excuse for Thiérrée to string together a long series of bits without any particular transition, like a kid playing dress-up, or a clown going through bits, or a street mime doing whatever it takes to keep an audience attentive. Occasionally, a cool image emerges (he turns a chair upside down on his back to become a four-legged creature with lit-up eyes) but much of what he does is simply show-offy. The performance reminded me of seeing Ariane Mnouchkine’s Theatre du Soleil in Paris doing a very talky four-hour piece about Cambodia in which all the actors felt compelled to demonstrate every single thing they could do with their bodies and their voices in one show. It was ultimately exhausting rather than impressive.